Smile Radio Yorkshire | Listen Free on Castbox. Catch all the great Smile Radio shows here again on demand, featuring an eclectic mix of shows and music to suit all listening tastes! From Sports talk to mental health, from Alternative to Undiscovered music check us out and find something new to make you Smile! 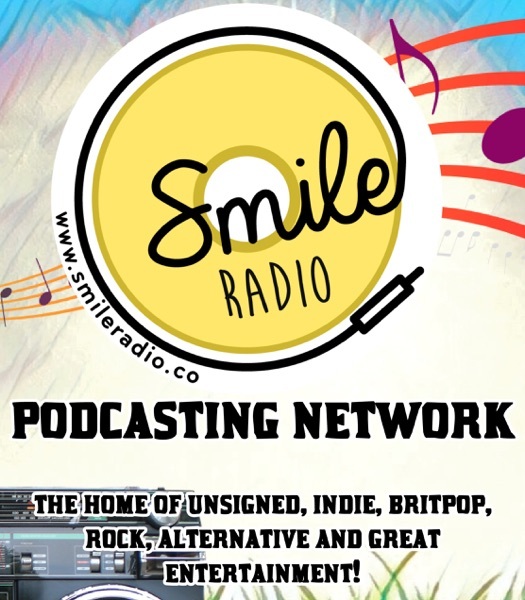 New to Smile Radio every Friday 2-3pm get a slice of the American Pie with "The Beth Williams Indie Singer/Songwriter Show" playing a mix of the best Indie Americana, country, folk and acoustic music! On this Show:Beth has a great selection of Indie Folk, Americana, Country and Acoustic music featuring songs from Gary Wimmer, Greg Forest, Lisa Beck, Andy Ard, John Duer & The Blues Freaks, Paul Chet & Whiskey Chickens, Lanae Hill, David Snider, Bob Wear, Honeysuckle Possum, The Scones, Karen Karsh, Arnold Connelly...And of course music from the shows host - Beth Williams.On Smile Radio every Friday Afternoon 2-3pm (U.K Time)Listen Live: www.smileradio.co or download the free app.Social Media:facebook: www.facebook.com/smileradioyorkshireTwitter: www.twitter.com/smileradio3Instagram: www.instagram.com/smileradio3 Home of the best new, independent music, great entertainment and good times! Tune in every Thursday Nights 9pm for "The GameboyZ of Smile Radio, unscripted, random chat, T.V, Film and Gaming talk with a dash of Comedy and a massive, helping of the best Independent Music and Featured Artists from around the world! On this Show:Tonights show features some chat about #StarWars #Formula1 #Cults and whatever hell the else #randomly comes up!It's after watershed so some of it maybe #NSFW! so tune in #LiveNUnrestricted its The GameboyZ on Smile Radio (SmileRadio3) tonight from 9pm!Hosted by: Ritchie Stonian Johnston (@Elstonian83) Jonathan Edwards(@jonathan.edwards.97) James Herrington (@herringtonjames) & Ryin Leeder #Darkfusion49Playing some great #Unsigned #IndependentMusic from the best #FeaturedArtists #IndieArtists and #IndieBands! Music:The Show also features music from Smile Radio's "Featured Artists" -Wild Horse &Third Time Luckie.Plus music from:Panic at the disco, Fallout boy, Molars, The Asuras, Joe Haggerty, China Bears, Shoreline, Spanish Love Songs, Outsiders, Everest, HAWK, Beach of Diamonds, Divin' Ducks, Demon Scar, Glossarium, Von Birch & much, much, more! It's the show with the #IndieRock #RandomChat and those guys - Jonathan Edwards (@jonathan.edwards.97)James Herrington (@herringtonjames)Ritchie Stonian Johnston (@elstonian83) & Ryin Leeder (@Darkfusion48)The Guys also Stream on Mixer playing on Xbox One.F: www.facebook.com/smileradioyorkshire/ www.facebook.com/TheGameboyZofSmileT: www.twitter.com/smileradio3I: www.instagram.com/smileradio3It's the #GameboyZ #Live #ThursdayNights 9pm! Another Import heads over from the U.S and hits us here at Smile Radio. For some Alternative comedy tune in to the Colonel Bacchus Radio Show from 6pm on www.smileradio.coSo come have a laugh and smile with something different from our overseas family!Here's a bit about the good Colonel - He's been doing this show since 1990 and he has a #Unique way to grab your attention with his opener!So, come on check it out and have a #Laugh this #FridayNight From 6pm!Listen online: www.smileradio.co or download the app for free on smart devices!Miss the show? Catch it again #ondemand: https://smileradio.podbean.com/ after it airs!#New from #America #Comedy #Music #Chat #Humour!Keep up to date on Social Media:Facebook:www.facebook.com/smileradioyorkshirewww.facebook.com/Colonel-Bacchus-Radio-Show-227210781071271/ Twitter:www.Twitter.com/smileradio3 Instagram:www.instagram.com/smileradio3 The home of the best new shows, the best new music, unique life perspectives, and great entertainment - Smile Radio!